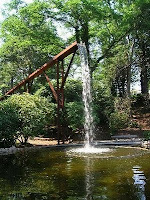 Within walking distance of our Cape Cod Bed and Breakfast is the amazing and beautiful Heritage Museums & Gardens. With its’ 100 acres of nature trails, gardens, and museums, it is one of the crown jewels of Cape Cod. The property on which Heritage sits is of great significance in the history of the town of Sandwich. The first person to live on the property was the widow Lydia Wing Hamilton Abbot, who moved there with her two sons in 1677. After her death, her brother Daniel Wing, Jr. and his two sons bought Lydia’s little house, which is now know as Orchard House. Members of the Wing family occupied the house until 1794. Much of the Wing family farm remains part of Heritage today and, although members of the Wing family have not lived on the property for years, their heritage remains an important part of the history of the museum. Successful textile manufacturer Charles Owen Dexter bought the property in 1921. He and his wife spent summers on the farm for the next 15 years and he worked in his garden hybridizing plants. 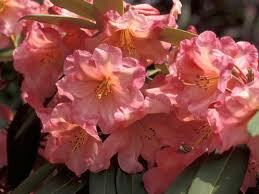 It was for his interest in rhododendrons that he became known. In 1935, they would move to the farm full time. Today the Dexter rhododendrons thrive and when they are in full blossom in June, thousands of visitors come to Heritage Museums & Gardens to enjoy their splendor. The Dexter estate changed hands four times between 1945 and when it was purchased by Mr. and Mrs. J. K. Lilly III who founded Heritage Plantation as a memorial to Josiah Kirby Lilly, Jr., an avid collector. The Plantation later became known as Heritage Museums & Gardens. Today some of the items you will see when you visit are from collections of J. K. Lilly, Jr. Housed in a replica Hancock Village Shaker round barn is the Automobile Museum. 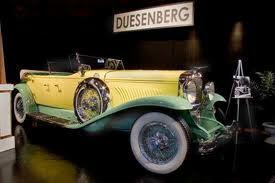 Inside is a stunning collection of vintage automobiles, including Gary Cooper’s 1930 Duesenberg and President Taft’s white Steamer, the first presidential vehicle. On the grounds is also an Art Museum that features an extraordinary collection of New England folk art. 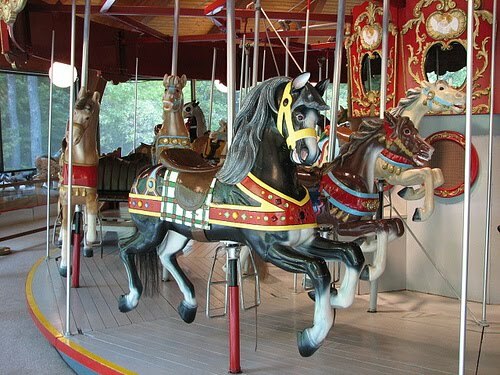 A restored 1912 Charles I. D. Looff carousel, housed in a building built especially for its display, spins all day long for visitors young and old. 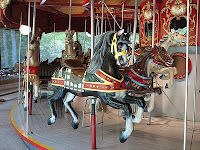 There is also an American History museum, Heritage Labyrinth, the Hart Family Maze Garden, and a working 1800 windmill. The newly opened Flume Fountain is a spectacular steel flume conveying a ribbon of water into a pool below in the Don Marvin Daylily Garden. New in 2010 is Hidden Hollow: A Nature Discovery Center. While visiting Heritage Museums & Gardens, you can have a bite to eat in their café and visit their gift shop. The spectacular 50,000 bulb garden blooms during April and their famous collection of Dexter rhododendrons will bloom in late May and early June, and in August, the grounds are ablaze with over 2,000 hybrid daylilies. Heritage Museums & Gardens sits atop the hills of Upper Shawme Pond on Grove Street in Sandwich. From Main Street (Route 130), turn onto Grove Street (beside the Town Hall) and follow it up the hill. The main entrance to the Gardens will be on your left. For more information see their website or call (508) 888-3300. Make plans for a visit and have a blooming good time. I am not an economist, but I have been learning a lot about international exchange rates and measuring their impact on business at our Cape Cod bed and breakfast. As the British pound and Euro have declined in value, the number of European guests has also decreased. And, as the Canadian dollar has strengthened compared to the US dollar, our guests from Canada have increased. So what does this have to do with wine? I have had the benefit of some very knowledgeable French-speaking guests from Quebec, Canada. Last week, Rick and Louise stayed with us for a few days and Rick shared his considerable knowledge and two very nice French wines. I am a neophyte when it comes to French wine. I have tasted many and am generally familiar with the major areas like Burgundy and Bordeaux. I even know that a red burgundy is typically Pinot Noir and a white burgundy will most likely be a Chardonnay. I also know that Bordeaux can be any combination of the six grapes, the “permitted grapes are Cabernet Sauvignon, Cabernet Franc, Merlot, Petit Verdot Malbec and Carmenere.” But beyond that, I am often at a loss to even read the label on a French bottle due to may lack of understanding of French and the intricacies of the French wine rating system. In California, the bottle usually clearly identifies the specific grape as well where it was grown and bottled. An evening with Rick has advanced my knowledge and appreciation for French wines. Rick graciously shared two excellent 2005 Bordeaux with me and our other guests. We started with a Chateau Les Trois Croix that is a Merlot and Cabernet Franc blend. Thankfully, the back label was in both French and English, but Rick added the unwritten details about where the winery was located and a bit of the history of the Bordeaux region. The second wine was a Chateau Du Courlat and also a 2005 and a Merlot blend. As Rick enlightened us, both wines are from the Saint Emilion sub region of Bordeaux. We liked both wines, but they were very different even thought they were basically the same grape and were grown very near each other. The first was not as smooth as the second and Rick felt it should be aged and will drink differently in a few years. That is the beauty of wine, it can give you a wide varity of expereinces, now and for years to come. 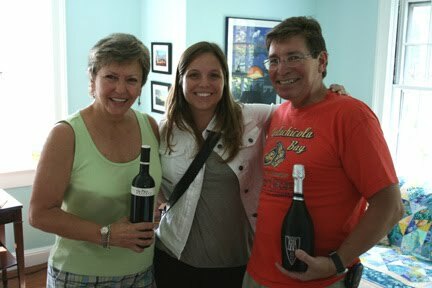 Thanks to my Frech Canadian guests for a great personalized French wine tasting in our Inn. The hidden lanes, winding pathways, and quaint streets of Sandwich Village lead visitors to wonderful historical discoveries and new adventures. Whether you are searching for a unique Cape Cod Bed and Breakfast for your vacation, some of Cape Cod's best local cuisine, recreation opportunities, or just want to relax and enjoy a good book on the beach, Sandwich has it all. Many distinctive boutiques, restaurants, museums, walking and biking trails, rivers to kayak, and museums and historic sites await your visit. 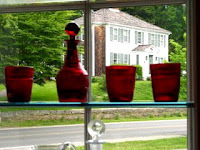 Located just across the street from our Cape Cod Bed and Breakfast is the Sandwich Glass Museum. With displays of more than 6,000 glass pieces, the museum tells the story of the towns’ greatest contribution to the American Industrial Revolution. The Boston & Sandwich Glass Factory, the first of its’ kind in the country, made its’ mark with an innovative method of pressing glass in a mold. This brought down the price of glass significantly, making it more affordable. One of our favorite exhibits at the museum is the Hannah “Rebecca” Burgess Dining Room. This replica circa 1880 dining room is the Sandwich Glass Museum's newest exhibit and is an important addition to the Museum. It displays many glass objects that were made right here in Sandwich and shows visitors how they were used in daily life during the Victorian Era. Through the use of technology and special lighting, the glass objects come to life. Visitors are able to spend a few moments with “Rebecca” and learn a bit about this charismatic woman. The museum is open daily for visitors to tour the amazing exhibits, watch glassblowing and pressed glass exhibitions, enjoy the Multi-Media Theater and visit their gift shop. During the summer months, the Sandwich Glass Museum sponsors walking tours of Sandwich that feature the town’s quintessential examples of American architectural styles from the colonial period to the early 20th century. It showcases people who lived in the village with amusing anecdotes relating to the famous and not so famous former residents. Check the museum’s website for the tour schedule. A unique aspect of our lovely Village is the Sandwich Boardwalk. It’s a short from our Inn in the village to the 1,000 foot-long Sandwich Boardwalk which spans Mill Creek and its’ marshes and leads you to a lovely public beach on Cape Cod Bay. Each plank in the boardwalk is a memorial to someone who has ties to Sandwich. Several years ago after a hurricane destroyed the boardwalk, it was rebuilt by planks that were donated by local residents. Each person who donated a plank had an inscription carved into the plank. The new boardwalk was completely funded by these donations. Some pay tribute to loved ones, both two legged and four legged, others commemorate a wedding or anniversary, one says simply “Slippery When Wet.” Part of the fun is reading the inscriptions as you stroll down the boardwalk and over to the beach. Whether at low or high tide, the view across the marsh grass to the sand dunes and water of Cape Cod Bay is breathtaking. At high tide it is common to see kids, young and old, jumping from the bridge into the creek. It is also a popular place for children to catch crabs. It is an easy walk from our Inn to the boardwalk. We are happy to provide you with beach towels or a couple of sand chairs. The weather here on at our Cape Cod Bed and Breakfast continues to be very hot. The air-conditioning is running full time and it has been too hot to have "wine patio". Our guests have been enjoying afternoon wine tasting in the cool dinning room and living room. 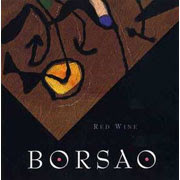 The guests have liked the refreshing red Spanish blend, Borsao, that I mentioned a few blogs back. The white I been offering in this heat is a nice crisp California Sauvignon Blanc, SeaGlass. Speaking of Spanish wines, we heard from our recent Spanish guests who live near the wine county of several wines I had in my Cellar. I mentioned Oriol and Nuria in my June 17th blog about the ‘small world of wine’. They sent this picture of Nuria and us holding the wines from their country. I am holding a wonderful Cava, Segura Viudas Aria, that Cellar 55 introduced me to last year. Cava is sparkling wine from Spain. By tradition in the world, and by law in France, sparkling wine can only be called Champagne if it is produced in the delimited Champagne AOC region of France. Many other countries make great sparkling wine by other names: in Spain it is Cava and in Italy it is often called Prosecco. Jan and I have enjoyed a number of bottles of the Aria Cava over the last year. I just added the Segura Viudas Brut Reserva in small bottles to my cellar to give to guests who are celebrating a special occasion. Jan likes to surprise them with a beautiful tray with a chilled bottle of Cava in a silver wine bucket and flowers. I’ll always drink to a special occasion. We thank our friends form Spain for sharing this picture and their special time with us at our Sandwich Massachusetts Bed and Breakfast. WOW has it been hot! The temperature here at our Sandwich Bed and Breakfast has been in the low 80’s with very high humidity for the last few days. Seems like weeks already, but it is July and our guests do come here for the sun. So what better thing for them to do on a hot day than go to a wine tasting called “Sizzling Summer Spanish Beach & BBQ wines”? Cellar 55 sponsored this tasting with the Boston Wine Company at the Belfry Bistro. The hot patio at sunset was the perfect setting for the subject wines. I always wanted to learn more about Spanish wines and I did, as we tasted a white, a rose and two red wines. The white, Botani, is made from 100% Muscat grapes. 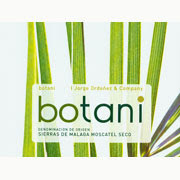 My first taste of the Botani was from a bottle that had sat in the sun for a few minutes and left me wanting. Gary, the Boston Wine Company representative, immediately replaced the warm wine with a properly chilled pour. This made all the difference in the world. This very dry and refreshing wine pleasantly surprised me, but I suggest you serve it well chilled. The two Spanish reds both use the Tempranillo grape; a common Spanish grape that I have heard of, but one that is not widely grown in United States. The first wine was Venta Morales, a 100% Tempranillo, and the second wine was Borsao, a blend of 25% Tempranillo and 75% Garnacha. Garnacha is the Spanish name for the French Southern Rhone’s Grenache. Grenache is also now widely grown in California. I found the 2009 Borsao blend much smoother and approachable for a summer wine. I have added this to my cellar and will be offering it to my guest this week. I also put some of the Venta Morales down, but want to taste it again when the weather cools off a little. All in all it was a hot night for wine tasting. I learned more about some great Spanish wines and will be sharing this wine with guests at our Sandwich Bed and Breakfast. Hopefully they will benefit from all my hard work. It’s a tough job, but someone has to do it. What more appropriate place is there to have a sandwich festival than the Village of Sandwich, Massachusetts on Cape Cod? On Saturday, July 10th, folks will get a taste of Sandwich Village during Sandwich Day and SandwichFest 2010. The festival takes place on Jarves Street from 12:00 noon until 4:00 pm. The street will be lined with booths featuring local artists and retailers. There will be a Farmers Market selling locally grown produce and fresh lobsters, live entertainment, and an Ice Cream Spin and Win, and a Dog Bowl with pup tricks and a dog parade. The street fair is free to all attendees. A tasty feature of the festival is the SandwichFest in which ocal restaurants will be on hand preparing and serving their best sandwich. For a ticket price of just $15 for adults and $6 for children 12 and under, you can sample all of the sandwiches and vote for your favorite. The sandwich taste-off will be held in a big tent behind the Belfry Inne and Bistro on Jarves Street. This day-long event is sponsored by the Sandwich Chamber of Commerce. Sandwich Day will also include a Sandwich Artisans Arts & Crafts Fair at the Sandwich Public Library on Main Street starting at 9 am; a Giant Yard Sale at First Church on Main Street from 9 am until 2 pm; a Shell Craft Fair at 136 Main Street; and an Antique Car Show at Heritage Museums & Gardens on Grove Street. The Chamber is conducting a Raffle to win $10,000 in cash. Tickets are $100 each and only 200 will be sold. The winning name will be drawn at 3:45 the day of the event. Bring the kids and the dog and come to Cape Cod’s oldest seaside village and spend the day. Additional information and a SandwichFest map are available from the Sandwich Chamber of Commerce. Rain date is Sunday, July 11, 2010. Chow.....did I really say that? Sandwich locals often speak of the fact that our lovely little village is the best kept secret on Cape Cod. We are aware of how special it is and how fortunate we are to reside here. Although very pleased, we are often surprised when we see our quaint little village in the news. Well, we made the news in a big, all-be-it unusual, way recently. Thanks to the folks at the Marshland Restaurant in Sandwich, we found our little town being highlighted on the big Food Network. The Food Network has been featuring segments called “the best we ever ate.” Chef celebrities who appear on the Food Network are featured talking about some of their favorite foods and where they have eaten the best of that particular item. Earlier this year, Duff Goldman, the Food Networks’ “Ace of Cakes” was featured in a segment about his favorite food, the Cape Cod Quahog. Now, Duff just happens to have grown up in Sandwich, Massachusetts and loves Quahogs. For those of you who don’t know what that is, it is basically a large clam and they are plentiful on Cape Cod. As a big stuffed quahog fan, Duffs’ choice of the best he ever ate comes from our very own Marshland Restaurant here in Sandwich, on Cape Cod. Needless to say, everyone in Sandwich is very proud of the Marshland Restaurant. Owned by local folks Marty Finch, Kim Babiarz, and Skip Cooke, the Marshland had been a landmark in Sandwich for over 50 years. We all know it well as most folks here eat there quite often. What you get when you go there is great food and reasonable prices and you know it is always going to be delicious. We know two innkeepers who eat there quite often. If you have never eaten a stuffed quahog, you don’t know what you are missing. The Marshland Quahog is a spicy, salty, briny, delicious concoction. If you are planning to visit Cape Cod this summer, come stay at our Cape Cod Bed and Breakfast here in Sandwich. When you make your reservation, mention that you read our blog and we will give you a gift certificate for a Marshland Stuffed Quahog and an “I got stuffed at the Marshland” tee shirt; one per reservation please. "The Best Thing I Ever Ate". Today we celebrate the birth of our Nation. It is important to remember always, but most especially this day, that so many have been willing to give their lives to ascertain the freedoms that we all enjoy in America today. All across our vast and beautiful country celebrations are being held. From the quaint town greens in New England to the farm towns in the Midwest, from the shores of the Pacific Ocean and all across the Southland, Americans gather to celebrate. Charlie and I are so fortunate, as innkeepers, to have guests come from all over the world to stay at our Cape Cod Bed and Breakfast in Sandwich. These international travelers frequently remind us how fortunate we are to have the freedom to express our thoughts and opinions. Even in this current sluggish economy, they remind us that we are still more prosperous than most of the world today. We give thanks every day for the American soldiers and their families who are sacrificing so much so that we can continue to enjoy the freedom to pursue our happiness. As we raise our voices in a solemn prayer. " So, fly your flags proudly and sing this song loudly. God bless America! I think summer is finally here. Last week we had a few days when we hit the low 80s and the air conditioning was running nonstop. On days like that, a cold beer may come to mind to many. But, to me, I think about my favorite summer wines. For my guest this week, I selected two great wines I found last summer at Cellar 55. I re-tasted the current release of Rosso Pesce and SeaGlass and I am excited to share them with my guest this hot July 4th weekend. Rosso Pesce is produced by the Tuscany Winery, Vicchiomaggio, and it is 100% Sangiovese grapes. The winemaker created it to “shatter the white wine with fish rule.” So this "red fish" wine is easy drinking; with red fruit flavors and very light tannins that go great with fish or anything off the grill. I love the label; it says it all. 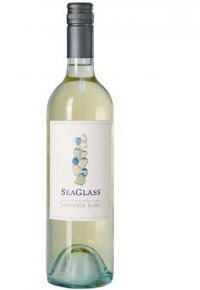 SeaGlass is a very refreshing Sauvignon Blanc produced by the SeaGlass Wine Company in St. Helena, CA. Although located in Napa Valley, all of the grapes are from vineyards in Santa Barbara County. The movie Sideways and a fascination with Pinot Noir may have put Santa Barbara on the map, but it has long been known for it Sauvignon Blanc. The cool ocean air and abundant fog are perfect for this grape variety. The stainless steel tank fermented wine has great tropical flavors and crisp acidity. It is the perfect "deck or patio" wine on a hot summer afternoon. The town of Sandwich was the world center of glass production in the 1880s and our guest still can find pieces of Sandwich glass on our beaches. SeaGlass is a wine that fits into the history of our Cape Cod Bed and Breakfast and tastes great too.